Nicholas Hellmuth adds Phase One P30 to the FLAAR Reports on medium format digital backs | Digital Photography. Nicholas Hellmuth adds Phase One P 30 to the FLAAR Reports on medium format digital backs. Courtesy of Greg Lamb, CEO of Global Imaging Inc, (globalimaginginc.com), it was possible to receive a Phase One P 30 medium format digital back from their Dallas office via Jack Ridley. It arrived in early June, 2006. We will be doing a complete review. This initial comment is just to indicate what is coming. You can see our past reviews of the Leaf Valeo 22, MegaVision dedicated B&W, Imacon/Hasselblad 4-shot/16-shot on appropriate other pages of this website. 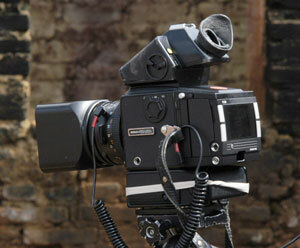 The current Phase One medium format digital backs during 2006 were the P 20, P 21, P 30, H 25, P 25, and P 45. Now the “+” plus series is available. Our first evaluation of the new series is of the P 25+, which arrived the first week of December 2007. Phase One also makes a tri-linear scanning back as well, for large format digital photography. Since we have several other large format backs, as well as an 80-megapixel Cruse digital camera, we have not yet had the opportunity to evaluate the system from Phase One. Price comparisons of medium format digital backs are not really the way to make a selection. Look at features, and realize that the software and user-friendliness (or lack of) is what counts more than megapixels or price. 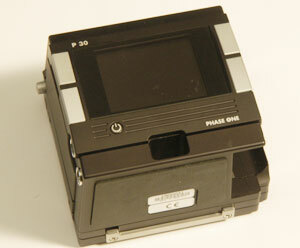 Phase one P30 medium format digital back. Phase One is reportedly the market leader with 60% of sales, which frankly says a lot for its cameras and sales staff worldwide. I say this because a camera back manufacturer who has no camera body manufacturer as full-time partner is like a duck out of water. And a camera body manufacturer without a full-scale alliance with a back manufacturer is an invitation to bankruptcy. Contax and Bronica both went belly up last year because they did not have a medium format sensor system partner. Mamiya recently sold itself one step ahead of this camera division going the same route to bankruptcy as Bronica and Contax had just suffered. Sinar is an exception to some degree: they make large format cameras, not really a true medium format and definitely no 645-format. Sinar was rescued by Jenoptik before it reached the point of going the way of Contax, Bronica, or Mamiya. But now Sinar-Jenoptik still lacks a medium format partner. Unfortunately the M-system of Sinar did not excite photographers as much as it clearly impressed the design committees who created it. Leaf , MegaVision, and Phase One have no full-time partner for cameras. The demise of Kodak’s medium format back program shows what happens when a digital back manufacturer has no camera partner. Kodak’s medium format system did not even survive 2004. So we are impressed that Phase One is still alive, and even healthy. FLAAR is interested in encouraging the health of medium format back manufacturers in part because these are excellent quality for museums, architectural history, art history, and archaeology. We began our medium format initiative several years ago and now intend to expand our coverage and dedication to medium format digital photography during summer 2006 and onward into 2007. Since we have Nikon and Canon 35mm digital cameras and recently received our third model of large format digital BetterLight, we have basic experience in all three size classes in professional photography. In the UK it rents for £246 including VAT or £210 without VAT. In the US the price is around several thousand dollars per month, though it is usually rented for the day, weekend, or week. The advantage of renting is that you can charge the expense to the client and write off the entire rental fee as a business expense. Global Imaging Inc rents Phase One (and Sinar-Jenoptik, Hasselblad-Imacon and Leaf backs) of all sizes. Their toll-free telephone number is 800 787-9801. Price for the back varies; cost can be $16,999 up to $18,999 depending on many factors. When quality counts, price is not always the issue. If you are satisfied only with an outstanding image, you need both a good digital system and outstanding software. Frankly software is usually more crucial than hardware. So Phase One has an advantage, because of their Capture One RAW software. This was already developed long before Adobe created .DNG or Photoshop RAW. What about the Canon EOS1Ds Mark III? Canon naturally wishes professional photographers to switch from medium format to the new Canon EOS 1Ds Mark III. But I recently was provided the Canon EOS 1D Mark III. It had such an issue focusing that I gave up. Most of the time it simply would not focus. I turned it back since there was no pleasure in even testing it. As soon as the Canon cameras are improved, I will try them out again, but in the meantime, I use a Nikon D200, which is significantly better than the Nikon D100 or Canon EOS 5D (which we also have now for over a year). Here is the Phase One P 30 digital back arriving in the FLAAR offices at BGSU. UPS was late (we recommend DHL or FedEx) and we almost missed the flight to Guatemala waiting for the package to arrive. 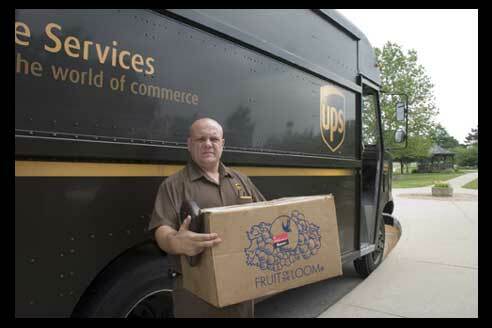 We had to send two assistants out in their cars to find the UPS truck driving around town and get the package directly from the truck. Fortunately all the delivery drivers know FLAAR at BGSU so the students were able to get the package without actually being the recipient (Nicholas Hellmuth). The UPS driver appears rather upset. This is not the regular driver on this route, yet he still turned the expensive package over to my students. So for once we are glad there was not much security! Now the camera with the Phase One back is in Guatemala, Central America, where FLAAR has a complete crew to undertake reviews of medium format digital systems. Here is Nicholas and Eduardo Sacayon, the head photography assistant. Claudine Escobar is a student of anthropology/archaeology who is interested in digital photography of archaeology of Guatemala and neighboring countries. Most recently updated December 10, 2007. First posted June 13, 2006. Updated July 11, 2006.